The spirit and energy in Hawaii is alive and well, and the majesty of the landscape inspires a feeling of awe and connection with nature. 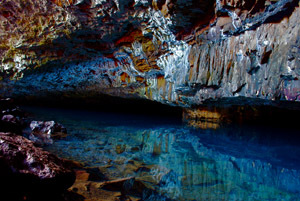 On my last day in Kauai, I was told about a magical place called The Blue Room, a cave that is not well known to the public, hiding under a mountain and filled with crystal blue water. As the legend goes, this is a sacred place of connection to the ancient Hawaiian ancestors. It is a place to go to meditate, to ask for support in letting go of attachments that are not healthy in our lives. Dropping thoughts, behaviours and patterns that are holding us back from happiness and freedom. So sitting with this theme, I visited this special place with the intention of holding a space to allow the release of attachments and expectations that I am holding, which are causing me some level of pain and suffering. Even though we don’t need to go to a sacred site to perform this type of exercise, it is important to explore where we have attachments that hold us back. To meditate on letting go and filling ourselves up with enough love so that we can truly know that everything is perfect just as it is. I often use the Byron Katie work to question any emotional pain or suffering I am experiencing, and then once I have found a new perspective, I like to sit in contemplation and breathe in the new visual I have of the situation. Seeing myself without what it was I thought I needed, and being happy and loving life. So I entered this amazing cave, swam across the icy cold blue water to the far side and sat on a rock and meditated and visualised letting go of what I need to, and filling up that space with love. And even though no Hawaiian ancestors came in to tell me I was now healed – I felt a beautiful sense of peace and freedom that has stayed with me. Why not find a special place in your area and create a letting go ritual for yourself. It can be a powerful and healing exercise. Thanks for posting this Leisa, I love hearing about your travels and how you put some spirituality into everything you do. Keep up the great work! I second that! Thanks for sharing your words of wisdom and your views on spirituality and life. In person that beautiful presence shines through – you are doing something right Leisa!